Surviving Madness Surviving Madness: GIVEAWAY: 4 Kindle Fires! Here we go everybody! Are you ready for this? Freebie Shark, American Familyy, Coupon Pro, and Mark Your Savings have teamed up with Acadiana's Thrifty Mom and a group of AWESOME bloggers to bring you 1, no 2, no 3, NO 4 Kindle Fires! 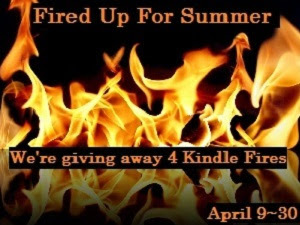 You read it right, there are 4, yes 4, Kindle Fires up for grabs in this colossal giveaway! We have taken all the work out of the Rafflecopter entry form (below) and made this as easy as possible! Enter today! Best wishes! Note: This giveaway is not affiliated with Facebook, Twitter, or Pinterest in any way. You must be 18 years of age to enter to win. This giveaway will be open worldwide. Freebie Shark, American Family, Coupon Pro, and Mark Your Savings with E are responsible for the distribution of the prizes. Please allow 6-8 weeks for delivery of your prize. I read all 3 Hunger Games books last month. Couldn't put it down!! It's been a while - Grad school! However, I'm hoping to start Hunger Games this week! Do children's books count? lol Honestly, it's been a couple years since I've been able too. I'm trying to pick it back up. Any book I pick up, I read cover to cover! The most recent being Kiss Me, I'm Irish! It's been a while - Grad school! It's been years since I read a book cover to cover! I read all the time.. a couple chapters here and there during the day when I can. I read at night before bed also but hate when I doze off and lose my page=) After I finish the current book I am reading, my son wants me to start Hunger Games... He can't get enough of it, he says they are that good. Finished all of the Hunger Games a little less than a month ago and started "Matched" shortly after that! I actually read Fifty Shades over the Easter Holiday. We had a lot of driving to do and I love to read in the car (I know, many can't) and I finished the whole book! It's been awhile, but last winter we had a few power outages and that was the only time I had nothing better to do but shiver under the covers with my iPad and read and I finally finished a book I had been reading for months. Thanks for a great giveaway! Just finished reading Domain by James Herbert,i found it a very good,keep you interested horror book. Just finished Domain by James Herbert. I admit it has been a while... I last read "I Walked the Line" before I had my ten month old!